CLA-The Effects of Cold Stress on Cattle by Sam Barringer, D.V.M. When temperatures begin to drop into the single digits, farmers should stop to think about the effect that severe cold weather will have on herd health. The bovine can be very tolerant of cold temperatures. The cow that has a good winter hair coat, adequate body condition, and readily available feed and water can withstand cold extremes that would be fatal to a human. However, even if the cow temporarily withstands these extremes she will pay a price. The price can range from loss of body condition to death from hypothermia. What is hypothermia? Hypothermia is defined as the lowering of body core temperature below normal values. Mild hypothermia would occur when the body temperature is in the range of 86-89 degree Fahrenheit. Moderate hypothermia occurs at 71-85 degrees, and profound hypothermia occurs under 50 degrees. At a rectal temperature under 82 degrees, the bovine can no longer return to normal temperature without external heat and warmed fluid therapy. The environmental temperature at which the cow will begin to experience hypothermia will vary. Short hair coats, high winds, and wet cattle will amplify the actual environmental temperature and induce hypothermia sooner. As hypothermia sets in, all metabolic and physiologic processes begin to slow. Blood is shunted away from the extremities in an attempt to protect vital organs. Frostbite of the teats and ear tips will occur at this stage. As hypothermia progresses, respiration rate and heart rate decrease and blood pressure drops. Eventually, the cow loses consciousness and death is imminent if rewarming does not occur. In most cases if windbreaks and adequate nutrition are provided, hypothermia can be avoided. However, additional health problems should be considered in the winter. Cattle are good weather predictors and will change eating habits before a large storm. Research has shown that cattle will increase grazing activity prior to a storm, ingest little feed during the storm, and increase grazing activity after the storm. If the cattle are on high-quality pasture, this will increase the chances for bloat. Make sure that water is available. If water is not supplied, cattle will reduce feed intake. Also, water deprivation followed by intake of saline water or of feed containing salt can lead to salt poisoning. Salt poisoning occurs after the water troughs freeze and the animals become dehydrated. When the troughs thaw, the cattle ingest large quantities of water. If the water has a high saline content or the cattle take in free choice mineral salt, poisoning can occur. Cattle with salt poisoning will have diarrhea and abdominal pain and will refuse to eat. Often they will be blind or staggering with a characteristic knuckling of the fetlock. Most of these cattle will die even after fresh water is supplied. Placing a water warmer in the trough next to a windbreak will prevent water freezing and keep cattle eating and drinking through the cold extremes. Propane tanks and car batteries can serve as an energy source for a remote watering trough. Frostbite of the teats can be a serious consequence of cold exposure. Once frostbite occurs, very little can be done to revitalize the tissues. Rapid thawing of the tissue is preferable and less painful than gradual thawing. If the teat end is devitalized, these cattle should be watched closely for mastitis at calving. If the winter is exceptionally hard, the pregnant animals may spend all winter using energy to generate heat. If nutrients are shunted to heat production, cattle begin to lose body condition. Cows, and particularly heifers, in poor body condition are at risk for calving problems. Also, these animals may provide inferior colostrum for the calf, and neonatal mortality may increase. In addition, these animals do not cycle on time and delay breeding in the spring and summer. 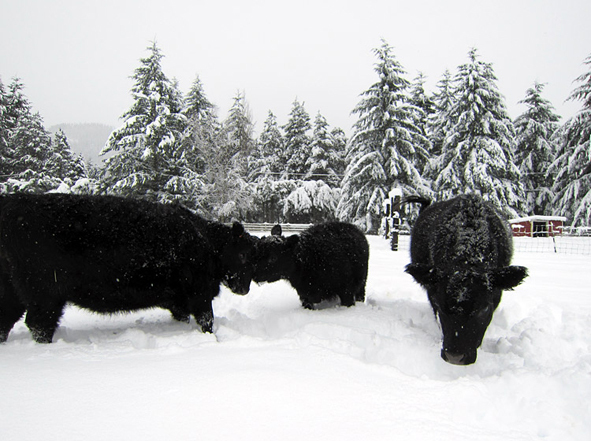 Monitor body condition scores throughout the winter and be prepared to supplement the ration with increased energy, protein, vitamins, and minerals when the cattle are exposed to cold temperatures for extended periods. Adult functioning ruminants will survive long periods of cold, but may pay the price at calving or rebreeding. What about the calf? The calf has very little fat reserve, is born with a wet hair coat, and does not have the benefit of a functioning rumen to generate heat. Calves can go through the stages of hypothermia quickly and if rewarming does not occur death cannot be avoided. Cows expected to calve in extreme weather must be given shelter or be under constant surveillance to prevent calf loss from hypothermia. The effects of cold stress will be covered more thoroughly in a future article on calving. Recognize that cattle may change eating habits with the onset of a big storm. Be prepared to prevent and treat bloat when cattle increase grazing after the storm. Maintaining water consumption is the key to encouraging feed consumption during prolonged cold stress. Warming devices will aid in preventing freezing of water and preventing salt poisoning in animals. Monitor body condition of cattle under prolonged cold stress and adjust the ration accordingly.